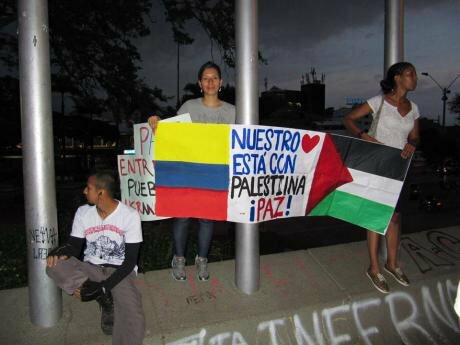 Pro-Palestine protest in Cali, Colombia. Wikimedia Commons. All Rights Reserved. In November of 1947, the international community approved a move that split Palestine into two states as a means to resolve the issue of Arab and Jewish nationalisms. Latin American nations of the then constrained UN – 20 states, or around half of the membership at that time – stood out for their majority support for said partition. 13 of the 33 votes in favour were from Latin American states. The region additionally stood out among states who did not position themselves: 6 of 10 abstentions were Latin America. Alongside Argentina and Mexico, Colombia was one of the nations to abstain. With the passing of time, Arab Palestinian nationalism and other abstentions from 1947 began to consider the partition as a vehicle for the realisation of the ever-postponed Palestinian state in the context of a comatose dual state solution to the Israel-Palestine conflict. In the final hours of the presidency of Juan Manuel Santos, this month Colombia ceased to be the only country of South America with unfinished business regarding the recognition of Palestine as a free, independent and sovereign state. In the final hours of the presidency of Juan Manuel Santos, this month Colombia ceased to be the only country of South America with unfinished business regarding the recognition of Palestine as a free, independent and sovereign state, despite being under occupation. Such a measure, syntonic with what the majority of the international community has adopted, had previously been contingent on an Israeli-Palestinian consensus. In other words, it was subject to the approval of those who for years have shown themselves as prone to assimilate Palestinian territories that Israel has been occupying since 1967 rather than to achieving a lasting peace, in spite of the proclamation a two-state solution was needed by Benjamin Netanyahu in 2009. In Bogotá, the outgoing Foreign Minister María Ángela Holguín explained Colombian recognition as a contribution to this solution. In her words, if the problems raised by the absence of consent between those directly affected by the decision taken in 1947 continue to be valid decades later, then the approved plan had been premature, and in need of “greater consideration, study and effort”. Ex-president Alfonso López Pumarejo, leader of the Colombian delegation of the UN in 1947, had contemplated unsuccessfully postponing the November vote until February 1948 to avoid the first of eight warlike explosions between the Arabs and the Israelis. Without disregarding the eventual triumph of partition, López warned that “the votes cast reluctantly and obtained through inappropriate requirements last minute”, in the view of pressures, coercion, and encouragements to pass the plan, would not be profitable for Jewish nationalism. Before the definitive vote, this prediction and the Colombian motion in favour of absorbing holocaust survivors into Palestine fed into fears that López was among those against the partition. Paradoxically, in the eyes of the Arabs, López was markedly pro-Zionist. In spite of this supposed double act played by López, during his first presidency, Colombia overtook more than one of its Latin American counterparts in terms of taking in Jewish refugees during the Nazi regime. A decree facilitated the arrival of Jews without documents due to being denied them by their countries of origin. With this change in the Colombian stance which also included avoiding the US recognition of Jerusalem as the capital of Israel, those desiring a two-state solution will look to familiarise themselves with Colombian expertise. Given they had no criminal record and sufficient resources to fund their first few months in Colombia, this measure became somewhat of a miracle solution for many. However, information gathered by a custodial institution shows that the 3000 Jews doubled during 1933 and 1943 sheltering them from the anti-Semitic eugenics of the Nazi regime. None of this proves the supposed pro-zionism of López, and in any case, it would be unlikely that such details of his management were known by many. Not any less unexpected than maintaining recognition of Palestine, something that Israel and supporters of the Israeli government wish to see reversed, Colombia will be included more among those who promote a two-state solution. This would create a whole new meaning surrounding the Nobel Peace Prize awarded to Santos in 2016 for reasons unrelated to the Israel-Palestine conflict. With this change in the Colombian stance which also included avoiding the US recognition of Jerusalem as the capital of Israel, those desiring a two-state solution, more than 130 other states that recognise Palestine, will look to familiarise themselves with Colombian expertise gathered throughout the endeavour for successful links with Washington in spite of the alleged role of US investors in the split of Panamá, given it is within the interests of the Palestine government.